Teachers and community resource representatives all worked together in support of our grade 5 students who put their hearts and souls into projects to be proud of! Kamiloiki fifth graders began working on the Exhibition projects back in September. They each chose subjects they were passionate about, e.g., ocean pollution, sports injuries, microplastics, video game addition, climate change, art accessibility, homelessness, childhood obesity, and more! Then they collaborated with classmates in small groups to research, prepare, and share their topics of interests. Community resources, experts in their fields, helped to provide additional information to the groups in order to support their learning. Finally, each group had to come up with some type of action plan they could carry out in our school community or beyond, as a result of their research. 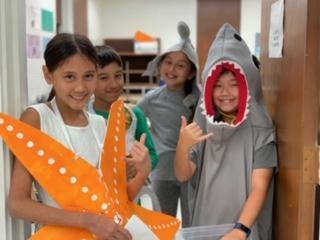 These action plans ranged from reducing the plastic forks in our school cafeteria to leading the exercises for the Cougar Cub Challenge to a mini-beach cleanup. Congratulations, Grade 5, on a job well done!